Shhhh, I have a guilty secret! I prefer waffles for breakfast over anything else! Waffles and I have had a life long love affair. When we were children, my father would drive us in to Hillbrow so that we could have a treat of waffles at Milky Lane. Since my first waffle I have liked them plain, with maple syrup and fresh cream. Every now and then, my waffle would get some chocolate as well. 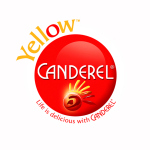 This treat continued for me until I was in my twenties and I was diagnosed as being sucrose intolerant. I had a waffle for breakfast and this did nothing to make what I thought were hunger pangs go away. A friend and I were shopping at Sandton City and I was ready to pass out from hunger, and a waffle was my first choice for breakfast. After eating it, I did not feel any better, and she dragged me off to the chemist who told me to cut sugar out my diet completely for a week and see if it made a difference. It really did, and the illness that had been plaguing me for 6 months went away completely. Knowing that I could never again indulge in waffles I had not made was not going to deter me. I purchased a waffle iron and set about perfecting a recipe so that I could satisfy my need for my breakfast treat. I was so glad I did as when Dave’s kids were in their teens and sleeping over at our house this became Mark’s choice of dessert. He would help mix, sift, stir and fold and then dose his waffles with food colouring, sprinkles and real maple syrup. This is the one ingredient we agree has to go on a waffle. I would ensure that a little bit of batter was left over for me for breakfast. It was not long before Mark saw the wisdom of this, and waffles became a breakfast choice. So easy for me! Nowadays, waffles are a weekend treat and I can indulge to my hearts content. Is there something you eat for breakfast that is a secret? 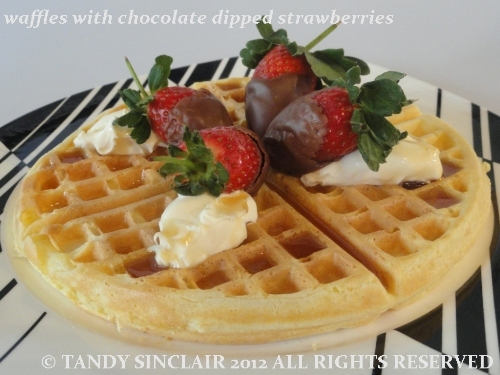 These waffles look like the real deal & I also love strawberries dipped into good chocolate! What a feast! I also love waffles, but sadly don’t eat it often enough! There now: we only discovered waffles and a waffle maker about three months ago or so: and have not yet found the perfect recipe. They may help 😀 Thanks! I love waffles too but I can’t tell you the last time I had one. Yours looks delicious. I hope your wish list becomes reality! I love peanut butter and jelly for breakfast but I don’t know how much of a secret that is. 😛 Waffles are pretty high on my list of favorites as well. I too love waffles but eat them very seldom! Such a bummer you can’t eat sugar-imbued waffles, Evie at the Belgian Waffle House in Strand makes some absolute beauties! These sound awesome though, and let’s face it, much better to go with sugar free if you can!